But your pet’s teeth don’t need to get to this point. When she visits the veterinarian for her annual or six-month examination, the doctor will check her teeth. He or she will be on the lookout for reddened gums, yellow-brown tartar and other signs of dental disease. The doctor also may recommend that your pet gets dental X-rays to check whether there are hidden signs of disease below the gum line and in the bones. Performing a full dental exam and taking X-rays require sedation, but it’s well worth it for the vital information these procedures reveal about your pet’s dental health. If there is any evidence of dental disease, the veterinarian will likely recommend a dental cleaning for your pet. Just like in human medicine, a thorough dental cleaning involves cleaning your pet’s teeth with a scaler and checking the gums for periodontal “pockets” (areas where the gums have pulled away from the teeth). But unlike people, cats and dogs don’t lay still for their dentist. Therefore, dental cleanings are performed while pets are under general anesthesia. Today’s pet anesthesia is extremely safe and, most often, the health threats of avoiding dental cleanings far outweigh the threat of anesthesia complications. Start with the basic tools: a soft-bristled toothbrush (ideally, one specifically for pets) or a finger brush and toothpaste. Be sure to use toothpaste specially formulated for pets, since toothpaste for people is designed to be spit out and can be harmful to cats and dogs when swallowed. Next, place a small amount of toothpaste on your finger and let your pet sniff and lick it. If there’s positive interest in the flavor of the toothpaste, use it. If your pet isn’t interested in the toothpaste, it’s OK to brush her teeth without it (several flavors are available, so you can always try a different one next time). Hold the toothbrush at a 45º angle to the tooth surface with the bristles pointing toward the gums. Work the toothbrush in a circular motion, concentrating on the outside surfaces of the teeth — and don’t forget the cheek teeth in the back. Go slowly, aiming to spend a total of 30 seconds on each side of the mouth. Some treats are designed to help keep your cat’s or dog’s teeth cleaner. Look for products that carry the Veterinary Oral Health Council (VOHC) seal. This seal signifies products that meet pre-set standards of effectiveness when it comes to controlling plaque and tartar in dogs and cats. While products that lack the VOHC seal certainly may work, you can be confident that products that have earned the seal are truly effective. It’s also helpful to know which treats you should probably avoid. For example, treats like cow hooves, pig’s ears and real bones can damage your pet’s teeth or cause other serious problems if ingested. 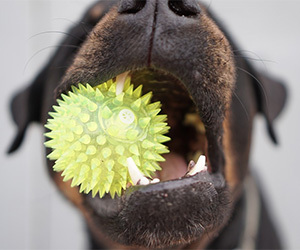 Also, as much as your pooch may love playing catch with a tennis ball, the yellow/green spheres are notorious for causing mechanical wearing of the tooth surface. If possible, offer your dog nonabrasive balls or toys. Not sure which toys are safe? Check with your vet. Keeping your pet’s teeth cleaner requires a commitment on your part. Your veterinary healthcare team will do its part by performing regular oral examinations and recommending dental cleanings as needed. As for you, about one minute of tooth brushing a day and the right food and treats will help keep your pet’s pearly whites a shining example of health — so the rest of her body will be, too.